I put together a little list of what I loved all February long! Finally I found a pair of jeans that satisfies me with a) the quality of denim b) the fit and c) a unique but still everyday style. These are the h&m kick flares with a raw edge and they come up as a mid rise waist. The colour is the classic denim colour I wanted and the silver hardware is extremely good quality. I honestly was 100% sold as soon as I put them on in the fitting room because I rarely find jeans that do all of the above for me. I work at Indigo Books and I can honestly say that I want to recommend this book to every customer that comes in! I had an amazing experience reading this book by Mitch Albom; it was a calm, suspenseful, insightful 4 hours that I took out of my day and it was so incredibly worth it. I was crying and laughing and falling in love with all of the characters introduced. This fictional book follows Eddie's journey past death and into what we believe we know is the afterlife. It is an amazing concept and will leave you completely awe-struck (or I know it did for me). 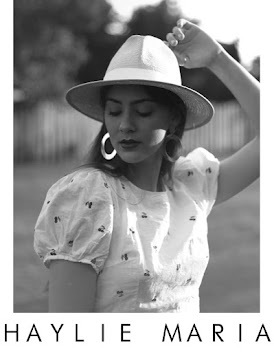 Recently I bought a wool heather grey hat which was my first wide-brimmed hat like these. I guess I had chosen the wrong size and wrong fit for me although I loved it, but when I found this one I instantly knew I was wearing my other wrong. This new one from Forever21, is a strong woven material that holds its shape extremely well on my head. I have gotten so many compliments on it while I have been out and about and I was really happy to give my old one to my grandfather! 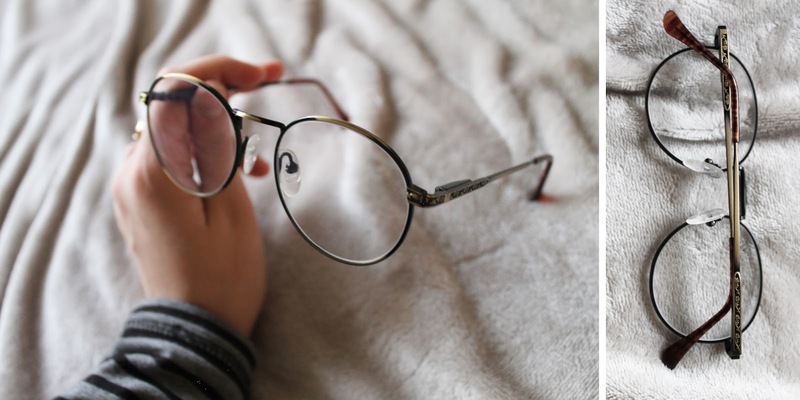 I have needed glasses for some time now but not to the point where I can't see a thing without them. These help me read titles from across the store at work, and help me feel more confident while driving at night but they also do great things to my outfits! Because I had to get new glasses, of course I had to find some shape that adds an extra accessory to my outfits. I purchased this gorgeous little wallet-on-a-chain type purse at Rudsak (which has amazing stuff by the way) for going out at night or just a quick way of keeping my cards safe with out having to lug some bag around. 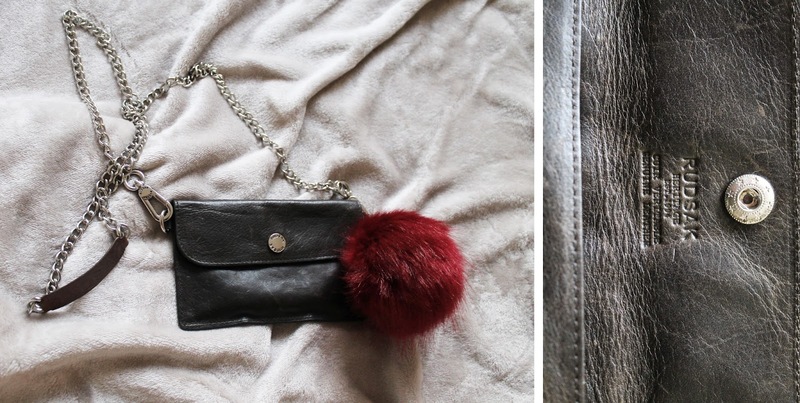 The leather is a gorgeous dark almost green colour and I actually love adding this red pom-pom keychain on it to compliment it more as a statement piece with my outfits. This little guy holds cards, bills, and even my phone and I know this will be in my closet for a long time as a staple. I finally splurged a little on my skincare because I was constantly unhappy with some scarred areas on my face. Sure it may not have been too bad but I was happy to get rid of it all together especially because it seemed like most of my acne had healed in the last couple months. 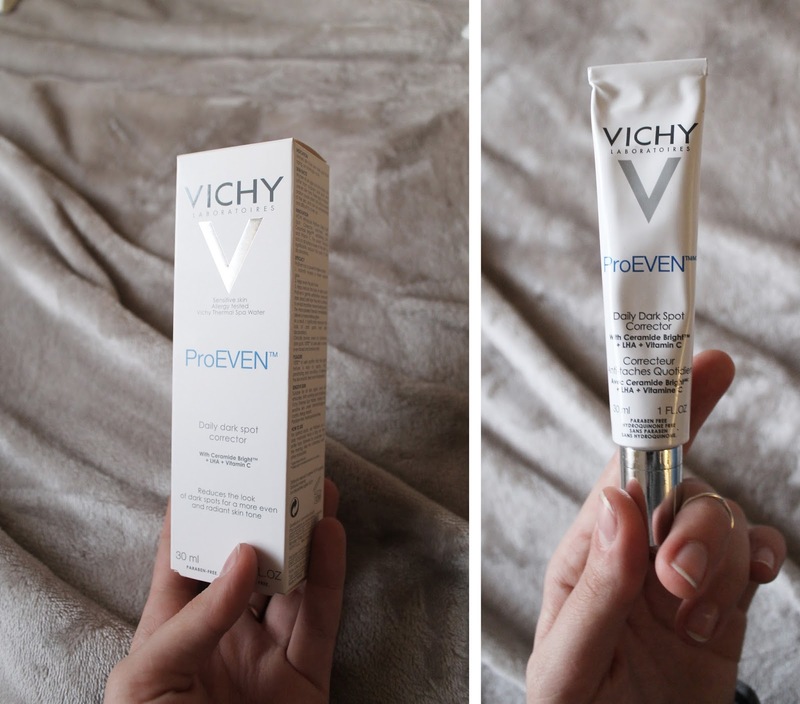 All I can say about this cream is that within the first week of daily use I already noticed patches of scarring fading. Plus the cream smells amazing and a little amount of it goes a long way! I'm excited to keep up the use of this product to really test its strength out. I FINALLY got myself a side table. This little green tin table was my great-grandmothers and I am so happy to have it here in my room. The colour works well with my coconut white walls and my taupe-grey bedding especially with the added marble accent I placed on top. Side note: I'm so happy with my new S'well bottle and my amazing Saje "Ultrasonic Nebulizer" from Sterling. The little gem makes my room smell like a super relaxing retreat and I'm so happy with it! Last but not least, I have been obsessed with PUP the band; a band that turns me into an angsty, rebellious teen who likes to yell the lyrics out loud in the shower and not give a ____. They are actually from Toronto too so, as a local, it makes me enjoy supporting them even more! Also, definitely check out the music videos for Guilt Trip and Dark Days, they are super rad.